Tom began his photographic career on a local newspaper in his native North-East of England. In 1978 he moved to London and began working freelance for publications such as the Sunday Times and Time Magazine. In 1997 Tony Blair gave Stoddart exclusive behind the scenes access to his election campaign, as the Labour Party swept to victory after 18 years of Conservative government in the United Kingdom. Ten years on he photographed Gordon Brown as he replaced Blair as Prime Minister. His extensive work on the catastrophic AIDS pandemic blighting Africa has been widely published and exhibited. 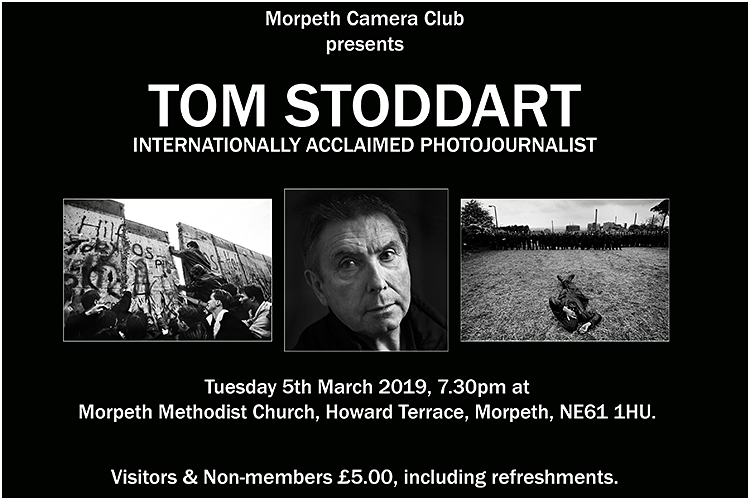 Tickets can be reserved (and collected on the door) by contacting Stephanie Robson (Publicity Secretary, robson-robson@hotmail.co.uk, or by visiting the website (www.www.morpethcameraclub.co.uk) and leave a message via the contacts page.